KMB took on an additional $1.13 billion in long-term debt last year to fund these rewards. And this year alone, it will dump at least $750 million into buying back its own shares, which are trading for more than 18-times its current forecast of $5.65 to $5.80 earnings per share (EPS). 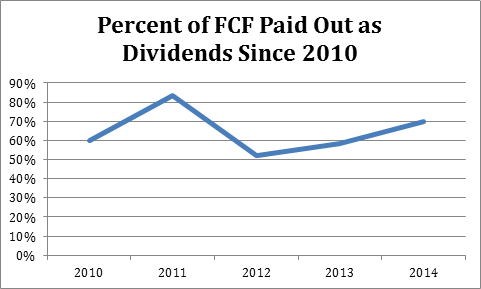 Between dividends and buybacks, KMB shoveled about 110% of its 2014 FCF to shareholders. Management believes it must buy back shares at any price to juice its bottom line, with top-line sales growing by only 3-5%. It’s hoping to boost its EPS faster than sales by reducing its share count. If shares were 50% cheaper, this might create shareholder value – but at 18-times earnings, it’s a poor use of capital. Other than buybacks, mature companies often look to margin improvement to boost the bottom line when revenue growth is slow. KMB in fact did boast that it increased margins in the second-quarter – but a broader perspective shows that its profit and operating margins are both flat since 2010 as well. When exactly did it become difficult to make money peddling brand name diapers, anyway? When the internet trashed the barriers to entry. For example, Jessica Alba’s startup Honest Co. sells premium nontoxic baby-products that many mothers – including my wife – insist on buying exclusively. KMB’s Huggies brand has not been allowed in my house – and likely never will. Conscientious “mom-sumers” have powered big sales growth for Alba. Her startup’s sales jumped from $60 million in 2013 to $170 million in 2014 (and gave the company a $1.7 billion valuation). There are some bright spots for KMB. Its own organic diaper sales are up 30% year-over-year in China, and its organic feminine care, baby wipe, and adult care products are up double-digits annually in developed and emerging markets. However these fast-growing segments are such a small portion of KMB’s sales that it’s struggling to make up for lackluster growth in the larger North American market. It also faces increasing competition from startup companies like Honest in the fast-growing organic segments (Alba’s products are already available in 2,500 brick-and-mortar locations like Target). Trading at 18-times earnings, and tapped out from a shareholder return perspective, KMB is priced like an aristocrat in its prime. In reality, its best years are behind it. I found 11 more stocks that are yield traps posing as dividend aristocrats. You should make sure that none of these issues are in your portfolio, as I believe you’re at risk for a 20% loss or more for each one that announces a dividend cut. You can click here to get my report right now: The Dirty Dozen: 12 Dividend Stocks to Sell Now. 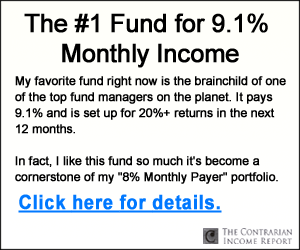 In addition to your report, I will also reveal a better, safer way to protect your dividend income, regardless of China, Europe, oil prices or the Fed. 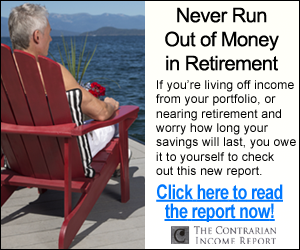 My new research service, The Contrarian Income Report, only launched a few weeks ago and our “secret” strategy has already turned up several 6%+ payers ready to weather almost any market storm. Unlock the secret to safe yields here.